When it comes to Thanksgiving, it's always good to have a contingency plan. Aunt Linda could forget the green bean casserole, the dog could eat all the Pillsbury Crescents, or the oven could break right as you're about to slide in your pumpkin pie. 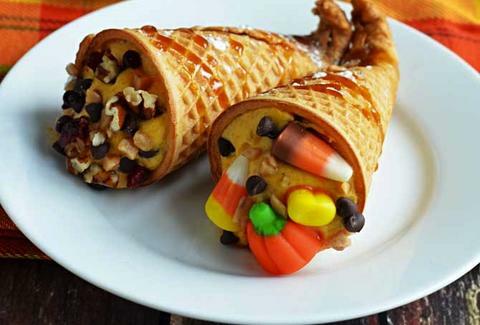 Just to make sure you're covered on the dessert front, Host the Toast came up with these inventive "cornucopia cannolis", which have all the pumpkin goodness of a traditional Turkey Day treat, with far less prep time. Like regular cannolis, these guys come stuffed with a cream cheese filling. Only this kind is flavored with canned pumpkin and pumpkin pie spice for added holiday spirit. The shells are simply ice cream cones that've been adorably mutilated to look like cornucopias, with a caramel sauce drizzle and powdered sugar on top. Host the Toast also shoved some candy pumpkins and candy corn in there to serve as the cornucopia's gourds and veggies, but if you just wanna go with classic chocolate chips, we're sure the Pilgrims will understand. And if not, well, they wore stupid hats anyway. Kristin Hunt is a Food/Drink staff writer for Thrillist. She has never seen a cornucopia in the flesh, and is unconvinced they're real. Follow her at @kristin_hunt.